BOGOTA, Colombia (AP) — FIFA has finally and fully approved video review to help referees at the World Cup. The last step toward giving match officials high-tech help in Russia was agreed to on Friday by FIFA's ruling council chaired by President Gianni Infantino. "We are extremely happy with that decision," Infantino said at a news conference, adding it would lead to "a more transparent and fairer sport. We need to live with our times." FIFA will now look to sign a World Cup sponsor for video assistant referees (VAR) at the June 14-July 15 tournament. Also, FIFA reported a $192 million net loss in its published accounts for 2017, and agreed to publish the voting choices of member federations in the 2026 World Cup bidding contest on June 13 in Moscow. A North American bid combining the United States, Canada, and Mexico is competing with Morocco for the right to host the first 48-team tournament in eight years' time. Up to 207 FIFA members will vote with the four bidding nations excluded. Infantino also answered with a firm and simple "No" when asked if Russia's current political tensions with Britain could affect its hosting of the World Cup. The landmark decision on using technology came two weeks after FIFA's rule-making panel, known as IFAB, voted to write VAR into the laws of soccer. That move still left competition organizers to opt to use video review in their games, and FIFA's ruling committee had to sign off on the World Cup decision. FIFA Council member Reinhard Grindel wrote on his Twitter account that clear communication will be important to make the system a success — and was promised on Friday by Infantino. Referees can call on VAR to review and overturn "clear and obvious errors" plus "serious missed incidents" involving goals, penalty awards, red cards, and mistaken identity. In 18 months of trials worldwide — including at the 2017 Confederations Cup in Russia, Bundesliga, and Serie A — reviews have often been slower than promised and communication has been unclear in the stadium. 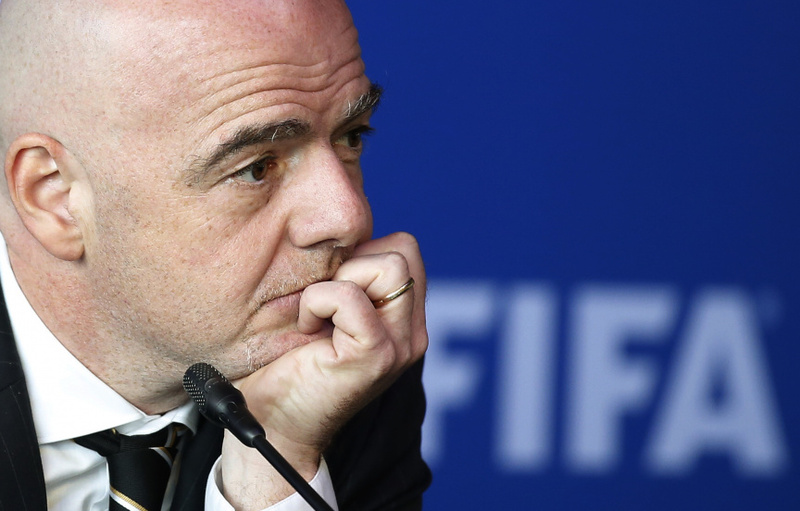 "Obviously it is not perfect and we are not going to reach 100 percent perfection," Infantino acknowledged. "What we definitely want to do is help." Controversy has been stirred even by the most experienced VAR officials who have handled many more games than most referees who will work at the 64-game World Cup. A total of 36 referees, plus their teams of assistants, are being trained by FIFA for World Cup duty and many come from countries which do not use video review in domestic games. FIFA's Council signed off on 2017 accounts which showed another loss, albeit less than half of the $369 million deficit in 2016, after another year of stalled sponsor sales. Still, FIFA has backloaded more than $2 billion worth of broadcasting deals into the 2018 accounts and expects to exceed its revenue target of $5.6 billion and show a profit for the 2015-18 financial cycle. The reserve fund is $930 million, a drop of $118 million from 2016. FIFA expects it to be at least $1.6 billion at the end of this year. FIFA failed to make progress on Friday on revamping national team competitions for women and youth teams. Discussions had begun on creating a global women's league, and merging Under-17 and Under-20 World Cups staged every two years into single, annual under-18 competitions. For the 2019 editions, FIFA picked Poland to host the men's under-20s and Peru the Under-17 World Cup.